JIN from K-pop boy group BTS made meaningful donation to celebrate his birthday. On December 4, Korean Animal Welfare Association shared a message on their official website. The organization said, "JIN from BTS has sent us some food, bowls, and blankets for the stray animals that we are currently taking care of." They added, "Thank you so much for taking your time to think about our animals here despite being busy. We are so grateful for the donated items. Thank you again for being there for these animals!" Shortly after, another animal welfare organization KARA shared the same news via their social media account. They wrote, "JIN sent us 322kg (approximately 710lb) of dog food to our center today! Happy birthday, JIN!" 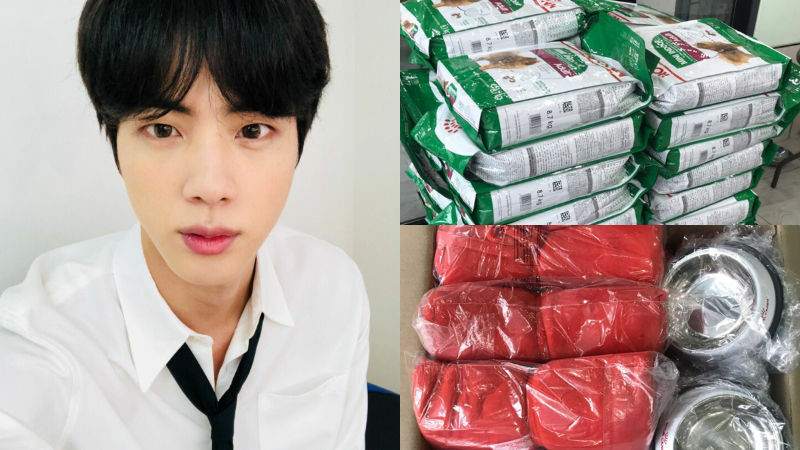 In response to this, JIN's management agency Big Hit Entertainment commented, "JIN personally went out to buy the items to help those stray dogs at the shelter. It was to celebrate his birthday." December 4 was JIN's 26th birthday, and it looks like JIN decided to do something meaningful for his birthday this year. After finding out about JIN's donation, ARMY (the name of BTS' fan club) around the world responded, "How sweet! JIN is such a caring guy! ", "Awww, my heart is melting! ", "JIN, the positive influencer! I should do that for my birthday as well.". and so on. Meanwhile, BTS is scheduled to perform in Taoyuan, Taiwan for two days from December 8 to 9 as part of its world tour 'LOVE YOURSELF'.